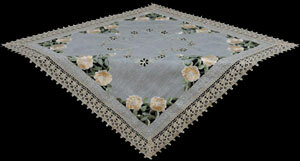 The Antique Golden Rose design is a traditional design. The rose suggests love and the colour golden symbolizes appreciation, grace and happiness. This is a very feminine design with exquisite fine embroidery detail. A lovely gift for a special occasion including golden wedding anniversary celebrations.